While I love traditional steak house cuts of beef…New York Strip, Filet, Ribeye, simply treated and perfectly cooked, I also love making “lesser” cuts of meat, bathed in sweet and tangy marinades, that are packed with all kinds of additional flavors. 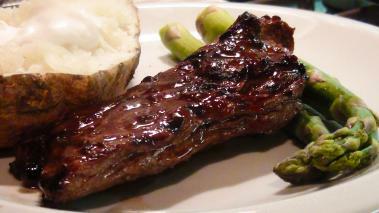 That’s exactly the type of recipe, I show you here with an Asian Marinated Skirt Steak. Skirt, is cut of steak, not nearly as tender as some of the aforementioned cuts, but when treated and cut right, it has a great texture, and frankly the natural beef flavor is even better than some of the more traditional cuts. It also makes a great steak for marinating. Here, I use some Asian themed ingredients, like soy sauce and Hoisin to give the steak another layer of flavor, and when cooked, a really nice charred crust. It’s one of my all time favorite steak recipes. Hope you enjoy it as much as I do! The measurements for the marinade don’t matter a whole lot. Just make sure you use enough to coat the whole steak (which is why I use a plastic bag) and don’t add any salt, which will dry out the steak. I like to marinate mine for 8 – 24 hours. Finally, to ensure the steak it tender, identify which way the grain of the meat is running (it should be obvious) and when eating cut the steak against the grain. That shortens, very long meat fibers, that otherwise would be very chewy. Serve it up with some of your favorite sides, and enjoy! Wine recommendation: This Asian Marinated Skirt Steak has a dream pairing with a rich, juicy and lush California Zinfandel. The meat has enough fat and richness to smooth out the tannin in the wine, and the generally full bodied, fruit forward zin will hold up very nicely to the slightly sweet marinate. And zinfandels almost always go great with grilled red meat. Enjoy!